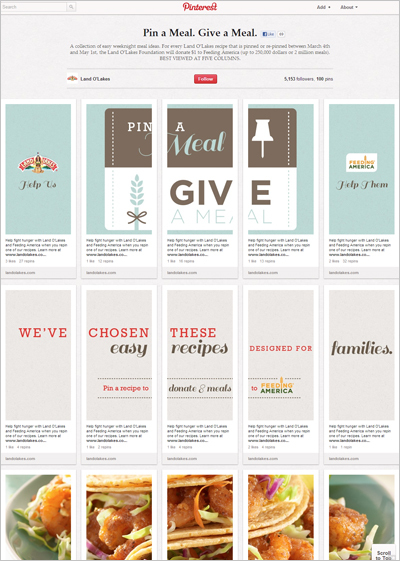 Minnesota-based dairy co-operative Land O’Lakes, is working with hunger-relief charity Feeding America through “Pin a Meal, Give a Meal“, a promotion encouraging people to share recipes on Pinterest. Feeding America helps provide food to more than 37 million Americans each year, and for every recipe pinned between March 4th and May 1, Land O’Lakes Foundation will donate $1 to the charity, up to a total of $250,000. The Pinterest board created by Minneapolis agency Colle+McVoy, is best viewed at 5 columns, where it can be read as a complete narrative.